Alexandria Ocasio-Cortez, D-N.Y., second from left and seen here in November, has secured a seat on the House Financial Services Committee. (Bloomberg photo by Andrew Harrer). The New York Democrat has long criticized the Wall Street banks overseen by the committee, which will be led by another progressive hero, Rep. Maxine Waters. WASHINGTON — Rep. Alexandria Ocasio-Cortez has secured a position on one of the House’s most powerful committees, pitting the New York Democrat against the Wall Street banks she has long criticized. With a seat on the House Financial Services Committee, Ocasio-Cortez will be at the center of discussions about whether big banks deserve regulatory relief, the need for housing affordability and the independence of the Federal Reserve. “I am very grateful for the opportunity to sit on this committee as a freshman,” Ocasio-Cortez said on Twitter. Less than a month after being sworn into Congress, Ocasio-Cortez has emerged as one of her party’s most prominent national figures, unafraid to use her Twitter account, and its more than 2 million followers, to drive an agenda — and agitate many on the political right. The 29-year old socialist Democrat could now train that spotlight on banks such as Wells Fargo, which has spent years attempting to move beyond scandals about alleged consumer abuses. The committee will be led by another progressive force, Rep. Maxine Waters (D-Calif.), who outlined a broad agenda on Wednesday, including $13 billion legislation to address homelessness, and establishing a first of its kind subcommittee to examine diversity and inclusion in the financial-services industry. “I consider it a privilege to hold the gavel,” Waters said before a standing-room-only crowd at the Center for American Progress. Lawmakers will also revisit Mick Mulvaney’s yearlong leadership of the Consumer Financial Protection Bureau, said Waters, who is the first woman and first African American to lead the committee. Mulvaney, President Trump’s acting chief of staff and White House budget director, has been criticized for severely weakening the agency while serving as its acting director. “While his time running the consumer bureau may be over, the time for accountability for his actions is about to begin,” Waters said. 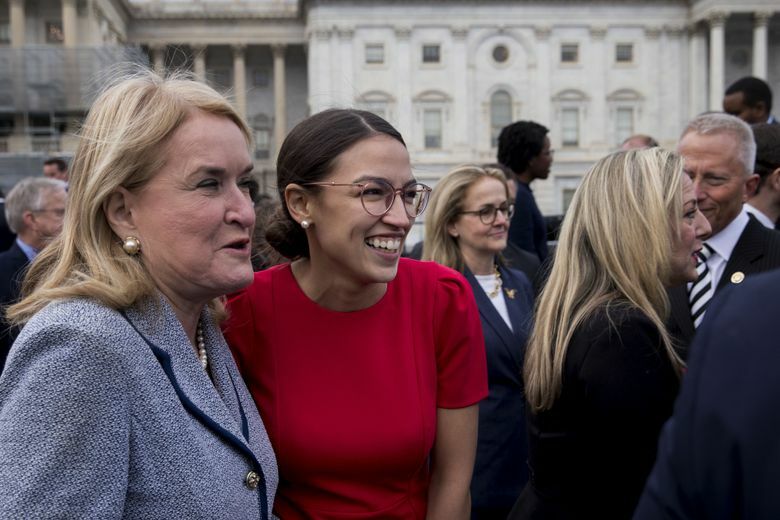 Privately, banking-industry executives and lobbyists have expressed mixed feelings about Waters’ leadership and Ocasio-Cortez’s short, but already convincing, track record for driving public conversations. While Waters is a well-known figure who has served on the committee for more than 20 years and developed a reputation for bipartisan deal making, Ocasio-Cortez’s legislative style is still unknown, they say. Big banks have already largely given up on securing significant new regulatory relief through Congress until after the 2020 presidential election, but being repeatedly hauled before the Financial Services Committee could still produce embarrassing headlines and lengthy investigations. Ocasio-Cortez’s “political clout may be significant and growing, but it pales [in] comparison with” that of Waters and Sen. Elizabeth Warren, D-Mass., Jaret Seiberg, financial-services analyst at Cowen Research Group, wrote in a research note Wednesday. Warren serves on the Senate Banking Committee and has announced a run for president. While laying out her agenda, Waters said there would be several hearings aimed at whether the financial industry is being held accountable for its actions and the need for tough regulations. But she also said many issues tackled by the committee could find bipartisan support. “Throughout my career I have looked for opportunities to build consensus,” she said, noting that she and the committee’s ranking Republican, Rep. Patrick McHenry of North Carolina, already discussed co-sponsoring legislation. In addition to Ocasio-Cortez, the committee is expected to add several other new progressive members, including Rep. Katie Porter, D-Calif., and Rep. Rashida Tlaib, D-Mich., according to Bloomberg. Porter studied under Warren at Harvard Law School and Tlaib is one of the first two Muslim women elected to Congress. The freshman lawmaker has already carved out several high-profile issues she plans to tackle from examining the student-loan industry to whether the U.S. Postal Service should offer banking services. The banking industry has watched both issues closely and complained that the Post Office would have an unfair advantage if allowed to compete for customers.